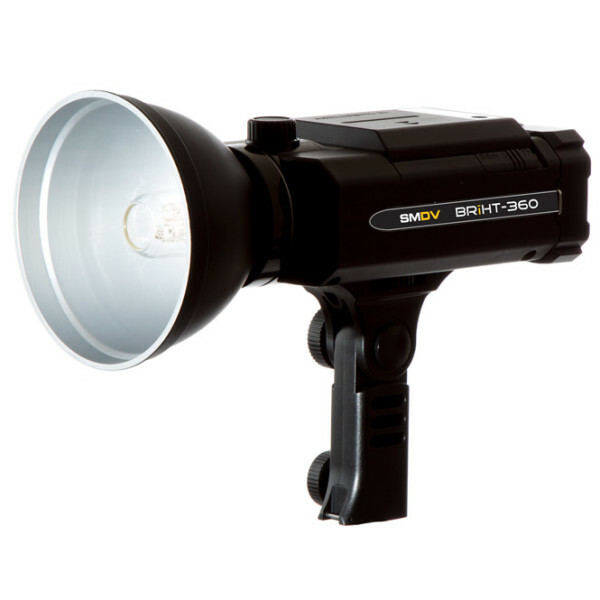 Korean manufacturer SMDV has announced the development of a bare-bulb flash, the BRiHT-360, designed to compete with the Godox Witstro AD-series. SMDV USA previously sold a rebranded Witstro AD360, called the PS-360. Their own BRiHT-360 (Bare-bulb, Remote-controlled, integrated battery, HSS, TTL, 360-Joule) flash is is finishing the “final stages of testing” with a planned release date in March 2016 in the USA. A Canon E-TTL radio transmitter will come first, followed by a Nikon i-TTL version. The same universal BRiHT-360 model can be used with either, thanks to its built-in 2.4GHz FlashWave radio receiver. 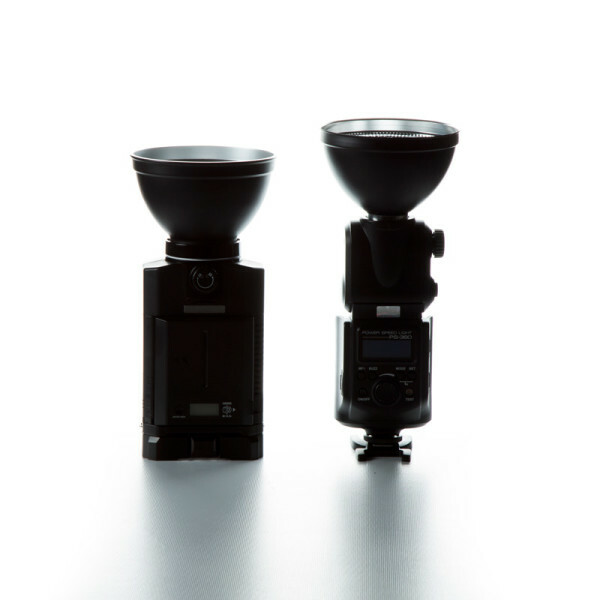 The company emphasises that the BRiHT-360 will have an integrated battery pack, unlike the Witstro AD360 and the Phottix Indra360, which are each powered by external packs connected via a cable. There is no shoe mount; instead it is supported by a removable tilt bracket that can be connected directly to light stands. It has a similar form factor to the recently-announced Godox AD600, but with less power. SMDV says it expects “the small and lightweight but powerful design will be welcomed by professional photographers”. 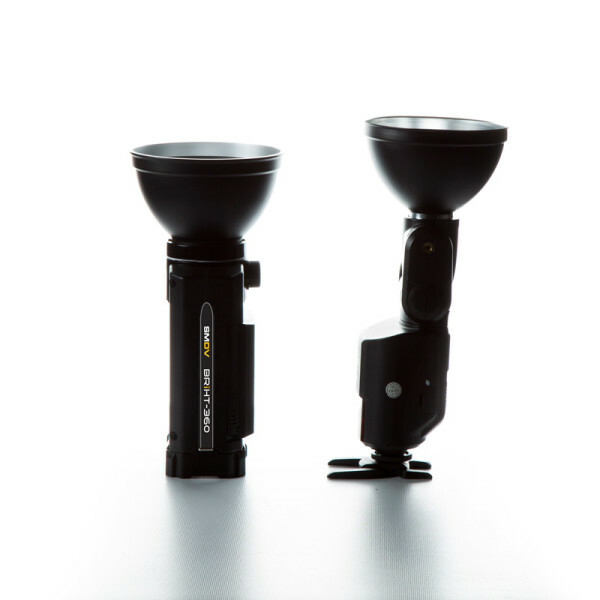 The following two images show it compared to the Godox AD360 head; the BRiHT is slightly shorter and fatter, and is a self-contained unit that doesn’t need an external power pack. 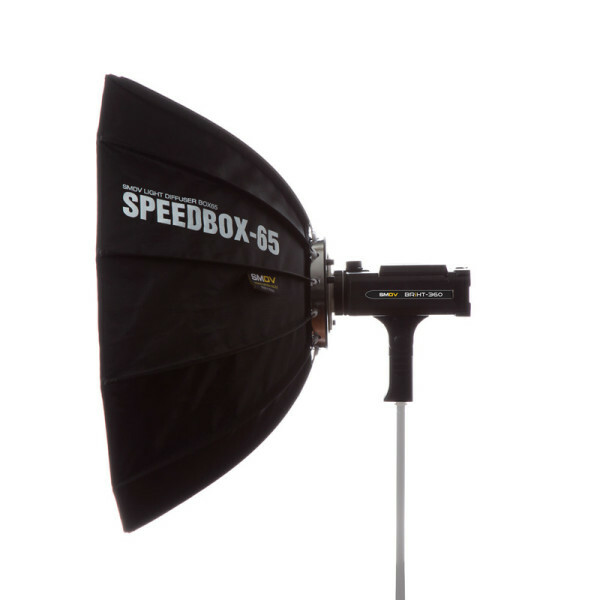 A mount on the head will support light modifiers, including SMDV’s portable Speedbox softboxes. It appears to be the same mount as the Witstro AD180 and AD360, for which a range of accessories including snoots, grids, reflectors, beauty dishes and softboxes are already on the market. For more information, visit www.smdv-usa.com.